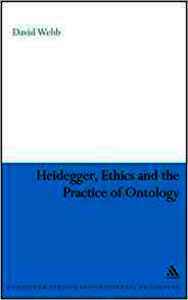 Heidegger, Ethics and the Practice of Ontology presents an important new examination of ethics and ontology in Heidegger. There remains a basic conviction throughout Heidegger's thought that the event by which Being is given or disclosed is somehow ‘prior' to our relation to the many beings we meet in our everyday lives. This priority makes it possible to talk about Being ‘as such'. It also sanctions the relegation of ethics to a secondary position with respect to ontology. However, Heidegger's acknowledgement that ontology itself must remain intimately bound to concrete existence problematises the priority accorded to the ontological dimension. David Webb takes this bond as a key point of reference and goes on to develop critical perspectives that open up from within Heidegger's own thought, particularly in relation to Heidegger's debt to Aristotelian physics and ethics. Webb examines the theme of continuity and its role in the constitution of the ‘as such' in Heidegger's ontology and argues that to address ontology is to engage in an ethical practice and vice versa.